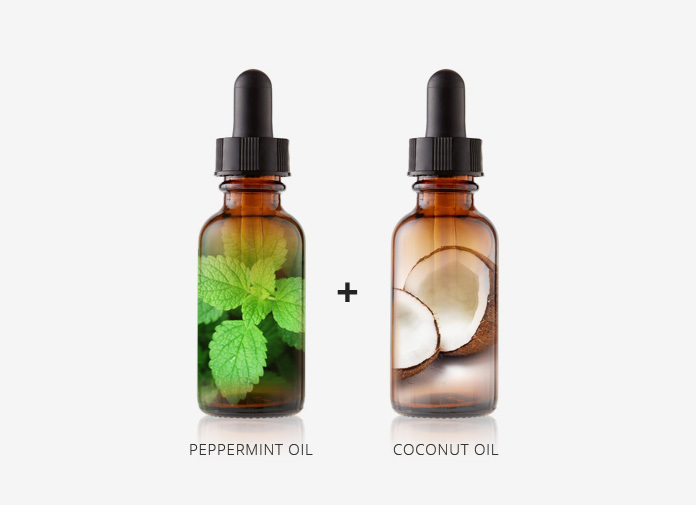 This hair growth recipe is inspired by the Peppermint essential oil study used for stimulating hair regrowth. In this recipe, we chose a different carrier oil from jojoba oil (what the researchers used for the study), to coconut oil in order to get additional anti-inflammatory and follicle nourishing benefits. Coconut oil is another popular essential oil used for nourishing hair follicles and fighting dandruff-related hair loss issues. Its anti-fungal and anti-inflammatory properties ensure the healthy hair growth by providing an optimal scalp environment. In other words, mix 9 drops of peppermint essential oil and 2 teaspoon of coconut oil together. Feel free to increase the amount as needed, but make sure to use the suggested ratio. 2. Apply the oil mixture to the thinning areas on your scalp.